All of our cabins are fully furnished, non-smoking cabins. Each is cozy and comfortable with local “Alaskan” décor, and a custom made Alaskan-themed stained glass door. No matter the size of your group, we can accommodate your stay. Three of our five cabins are furnished with four twin beds, and the other two are furnished with two twin beds and one queen bed. Just the right size for your stay, each cabin has a private deck with a BBQ grill, private bathroom with full tub/shower, dining area, living area with TV, and full kitchen with dishware, cookware, refrigerator, stove/oven, microwave oven, coffee maker, and toaster. In addition to comfort, our cabins are functional as well. Enjoy ample counter space for preparing meals, wash your clothes for the next day in our coin-operated laundry facility or have your catch of the day professionally vacuum sealed and flash frozen for the trip home. 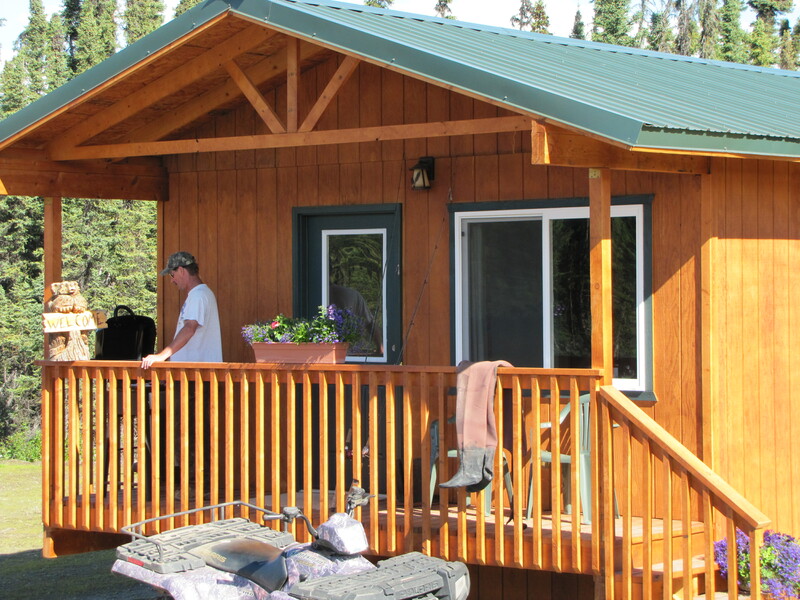 One of the best features at Alaska Moose & Spruce Cabins and Lodging is our centralized fire pit and picnic area. Spend time with your family around the campfire, or share stories with new and old friends as you roast marshmallows. Our open common area lets you enjoy quality time with friends and neighbors, yet still have the privacy and comfort of your very own cabin. Don’t worry about having enough freezer room for your catch. We’ll help you vacuum seal and flash freeze your fish. Few things in life are as relaxing as sitting around a campfire after a long day of fishing and sightseeing in beautiful Alaska. After a long day on the river, you can relax in your very own cabin. Each has a private full bathroom, kitchen, and living area. Call us today to schedule your stay at Alaska Moose & Spruce Cabins and Lodging! We’re always available to speak on the phone if you have any questions about our cabins or any of the activities you plan to do while you’re here. If you have larger groups or you’re planning a special event, please contact us for available discounts and custom packages. All our rates are based off of double occupancy. If you’ll have more people please call for a more accurate rate. We can’t wait to hear from you!